I am so sorry to hear about Jan passing. She was a very good friend of mine. She will be missed in the independent living community as well. I will miss her. A shining light has gone out. It’s been years since I’ve been with Jan in person, but I have carried her tenacious spirit with me always. Every moment I spent with her was a joy and a blessing to me. Our hearts go out to you in your time of sorrow. A thought of comfort and condolences to the grieving family. Jan was a great advocate, leader, friend and leader. Will be missed. GOD Bless! Jan lived an amazing life. On behalf of both Ben and Tom,please accept our heartfelt sympathy in your time of sorrow in the passing of your sister and daughter..
Jan was a wonderful woman. She was always so gracious and kind to me and to my son Erick. She was my mentor as well as my son’s. She helped me over the years so much. I learned a lot from her. She will be deeply missed. I’m so sorry for your loss. Sending love and prayers. Renee, Your sister, Jan, was indeed an amazing woman!! What a list of outstanding accomplishments that she made during her life for the improvement of the lives of others. Please know that you & your mother are in my thoughts & prayers now & in the days ahead. God be with you!! I am so sorry for the families loss. Jan was a strong advocate for those with disabilities but she was much more. She was always nice to me especially when I first became involved in the DD Panning council and I had so much to learn. I was blessed by knowing her. My prayers for the family. Janet Lynn Lilly was my cousin, and a very special one. I grew up spending summers in West Virginia and most of the time it was with Janet and her family. I loved being there with them and it was during those times that a strong bond was formed between Jan and me. My first memories of Jan are not of her in a wheel chair, but of a tiny little girl with blonde curls, pulling herself around on crutches, gingerly at that, with heavy braces on both legs. The wheel chair came later. Janet could not walk like other kids, but that was the only thing different about her to me. We shared so many wonderful, fun, times just being kids. Mostly we played “sit down things”, like school, or office, but sometimes we played hide and seek outdoors, when I would help her hide, or wheel her around finding the others. The most fun we had was making mud pies in her back yard, pretending we were working in a bakery. I would scavenge for berries, flowers, and pretty rocks to decorate our confections. We got dirty and we loved it. Another vivid memory was of me pushing her down that dirt road to the Dairy Queen for an ice cream. Going down wasn’t so bad It was that trip back up the hill that was difficult. I probably weighed all of 65 lbs. so I’m sure we were quite a sight trudging our way back home! As we got older, we saw less and less of each other, but kept in touch by writing letters through her high school and college years. We did have the opportunity to visit each other several times throughout our adult lives, and those times were always special. Lately phone calls and Facebook are how we have kept up, and of course her sister Renee’ and my Aunt Jennie kept me up to date on Jan. I was devastated to hear of her death. It is so hard for me to think that she is no longer on this earth. I know all her family and friends are suffering her loss and will miss her dearly, as will I. But I will choose to try focusing on her life, rather than her death, because Janet Lynn Lilly lived. 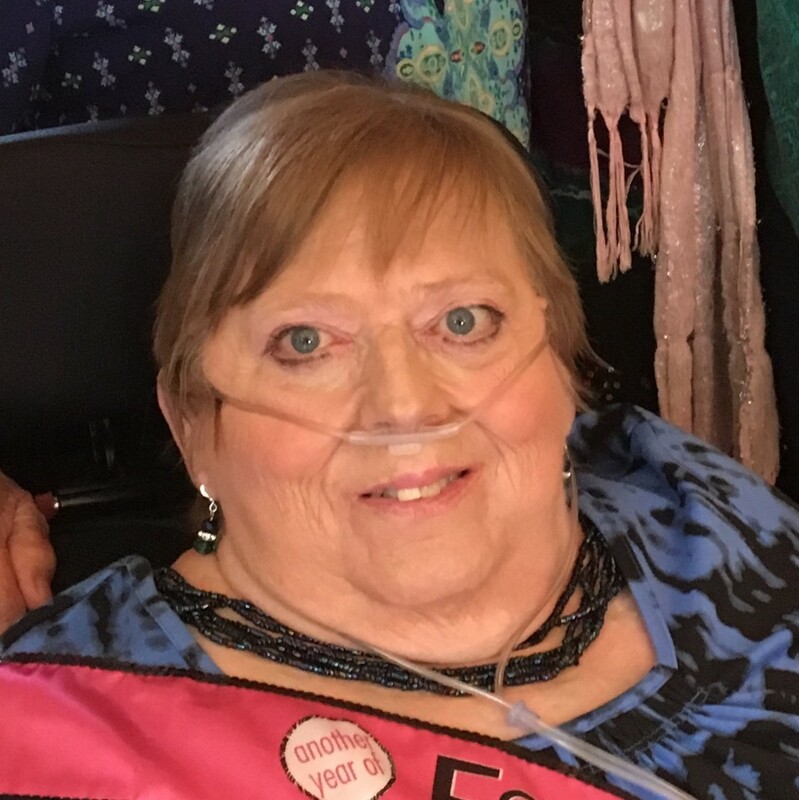 She lived a life of joy and laughter, of making friends wherever she went, of music and dancing (yes she danced), of love and passion, of learning and teaching, of leading and helping, of encouragement and adventure, and of accomplishing more from a wheelchair than most of us with able bodies will ever do. Jan is my hero and my inspiration. I will always love her. And love never dies. Jan was a warrior. Her legacy will continue to inspire change and empowerment for years to come. The disability rights movement cannot be the same without her. She was my friend and will live on in my memory. Our thoughts, hearts and prayers go out to the family of Jan. She was quite a woman and certainly left a lasting impression on family, friends and the world. Rich Bishoff – Licensed Funeral Director L.I.C.